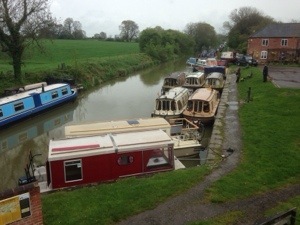 On Thursday 1st May boats started to gather at Pewsey Wharf in Wiltshire on the Kennet and Avon canal. 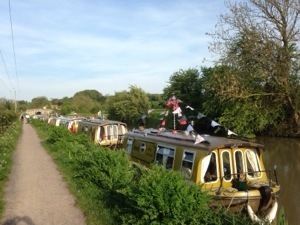 Some boats have travelled along the canal from either direction. Some from their mooring location on the canal both near and far, some launching at slipways further away such as Newbury and Devizes and others to launch directly from the Pewsey Wharf slipway. These owners then moving their cars/trailers to near their finishing locations such as Semington or Bradford upon Avon marina. Unfortunately the weather was not kind to those arriving as it was dull, wet with periods of rain. 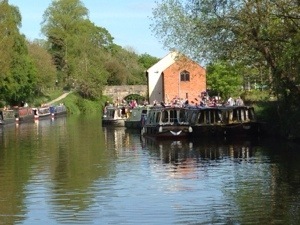 But with the help of fellow boaters, including those owning steel narrowboats moored adjacent to the slipway, boats slipped easily into the water. 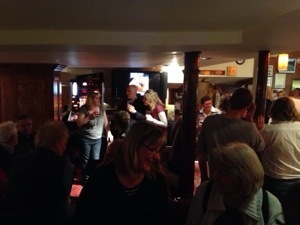 Once watered, boats moved on along the canal to Walcott, a pretty little Wiltshire thatched village, where many owners renewed friendships and enjoyed a meal and reminiscing in the Swan Inn’s function room in the village. More boats are due to arrive tomorrow on Friday 2nd May. We woke to a chilly but clear day and the sun shinning on Willcott village cricket field, with the birds singing and sheep and lambs calling to each other. 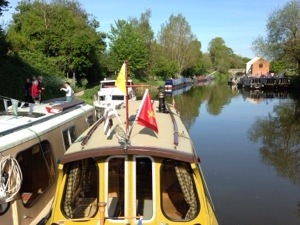 As we wait for the off so the bunting starts to appear on the top of the boats and a discussion on if we will get under bridges and branches without taking them down. 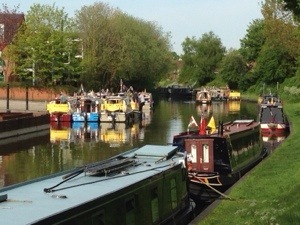 At just after 10am, the final 3 boats arrived from Pewsey Wharf and 16 boats started off processing towards Devizes along the 15 mile pound. We had a quiet cruise until at bridge 130, we stopped for a photo opportunity with a 4×4 boats rafting up. 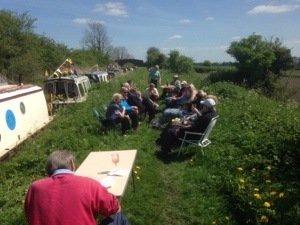 Once the photos had been committed to memory cards, the boats moved off a couple of hundred yards to moor up for lunch and the deck chairs, tables and BBQs appeared on the towpath. 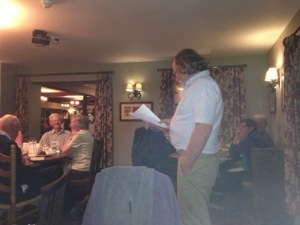 Towards the end we are joined by the man who made all this possible. Ian Graham arrives from Devizes on Matchbox, a Beaver Cub, with silver 25th anniversary balloons flying. 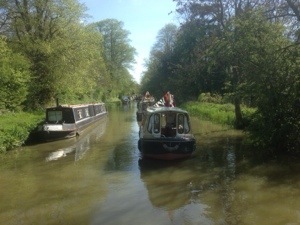 Lunch completed, we mounted our boats again and in the glorious sunshine and Wiltshire countryside we processed on towards Devizes. As we pass other boats and people on the towpath we get waves and questions on what is going on. 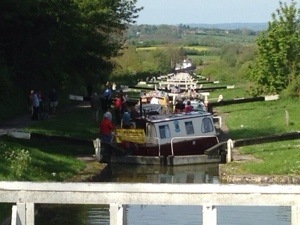 As we arrive in Devizes basin our thoughts change to will we all get in. In the end we split into 2 groups with around 6 on the towpath side and the 11 breasted up to 3 deep on the car park side. At just before 7pm we leave for the local Wetherspoons to get together and to remember Keith Hadden, our first Chairman who died a few years ago. Off to bed as tomorrow brings the mass decent of the Caen Hill flight as we continue on to the Barge at Seend. Awoke to another day of sunshine. Whoever organised this event (the club Chairman) obviously has very superior connections. 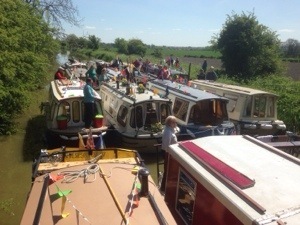 Everyone was up as requested and ready for the off at 9am from Devizes wharf. Already organised into lockfulls, the 4 different teams progressed down in turn to the first lock. We had just received instructions from a CRT representative that they had already had 6 boats down already and so too much water at the cafe and would we only open 1 paddle on the bottom gates to reduce the flow until we got to the main flight by the cafe. As we all started the descent, so the crews started to get organised. 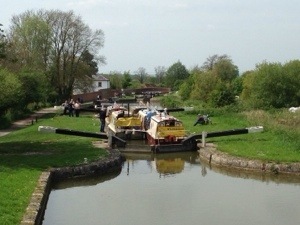 After a few locks on the main flight, the first 2 teams stopped to allow the last 2 to catch up as they had been held up due to a narrow boat coming up. Ohh and someone buying ice creams from the cafe!!! 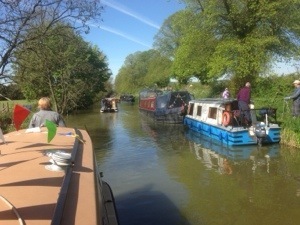 After we started again, we started to meet narrowboats coming up. 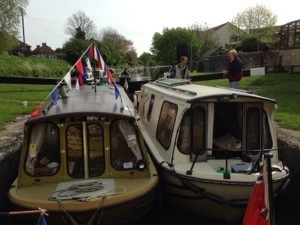 Our team split 2 boats either side of the channel, allowing the narrowboats a clear passage. Unfortunately one of our boats strayed too far into the side pond and got a propeller caught in the boom. They had to be rescued by another boat. All in front of a considerable group of gongoozlers. Finally we reached the last 4 locks in the main flight, where we had a photo call. Once we were all down, this photo call was repeated by lining up all 18 boats in a line across the pound. Once the photos were taken, we started down the flight again, but not until we had received applause from onlookers at the adjacent campsite. 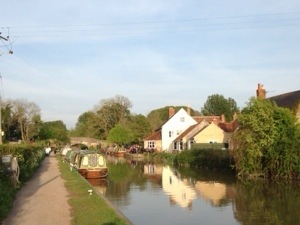 Over the next hour or so we progressed to our final destination, The Barge at Seend. About a 3rd of boats stayed in that pound the rest decending to the next. 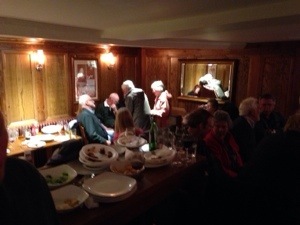 Then it was into The Barge for our final get together with a great meal and a speech by both our Chairman, John Parker and our manufacturer Ian Graham. John was presented with a card signed by the members thanking him and his wife Sandra for their hard work in organising the very successful event. Tomorrow we all disburse and go our separate ways.